A tasty oil and vinegar combination can take a dish from okay to amazing. 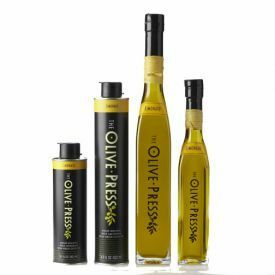 When I found The Olive Press and saw their flavored oils and vinegars, I knew that I had to try them. I was sent the Multi Fiesta Pack which retails for $38. This pack comes with Champagne Balsamic, Mission EVOO, Limonato Olive Oil, Strawberry Balsamic, Blood Orange Olive Oil and Italian Blend EVOO. I love the wood case that these come in. It is pretty enough to store on your counter. The first one that I tried was the Limonato Olive Oil. I recently bought a ton of sugar snap peas on a great sale and decided to cook some of them up for dinner. I added about 2 teaspoons of oil to a non-stick pan, heated it up and added my pea pods. I cooked them for about 8 minutes on medium heat. They were very tasty! My husband and I were both a fan. It was slightly lemony and you could tell that it was a good quality oil. The following night, I made us some giant salads with chopped romaine, cucumbers, tomatoes and green peppers. I drizzled on some Champagne Balsamic and a bit of the Mission EVOO. Both were delicious. It did not need any additional flavors which I usually do add some nutritional yeast and garlic to my salad dressings. Compared to other balsamic vinegars, it was stronger and had more flavor which meant that I could use less. My husband really liked it too. I am impressed with this set of oils and vinegars. All three that I have tasted so far are very tasty. I believe that by using better quality ingredients like these, you can focus on using less ingredients and can taste the food better.